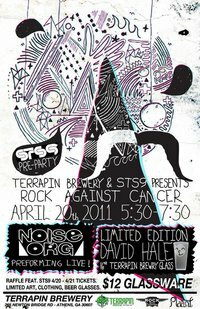 The Terrapin Brewery in Athens, GA is hosting an official pre-party before STS9 hits the classic center for a highly anticipated two night run. The event is actually a "Rock Against Cancer" show where all proceeds will go towards cancer research. The tunes will be provided by some dear friends of mine otherwise known as Noise[Org]. Trust me when I say these guys know how to play some beautiful music. The organizers of the event graciously asked us here at iwallyphoto to donate some prints toward the event's charity raffle. We'll be donating two multi-print custom frames and feel honored to have work along side some of our all time favorite artists. Some of the additional artists donating work are Jason Garcia, Kris Davidson, David Hale, Andrew Wagner, Christian Jaxtheimer, Plaant clothing and more. A BIG thank you to Julia at Soho Myraid Gallery for helping out with the frames. Another thank you to Kat at the Moog Gallery for coming through in the clutch with some last minute adjustments. Both are great places to visit concerning custom frames and art design in Atlanta. Pictured below: custom framed prints we're donating (top: 2 8x10s from the 2009 Athens run || bottom: 3 5x7s from the acoustic tabernacle set 2010), custom event glasses by David Hale and the event poster. Can't wait to see you guys there and raise some funds toward beating this cancer thing!